"Helping you NEGOTIATE through all the real estate noise"
Selling a home adds chores to your already hectic schedule. First, you need to find a good agent to represent you. Then, there’s your “honey-do” list. And, of course, you’ll need to maintain your property while it’s on the market. 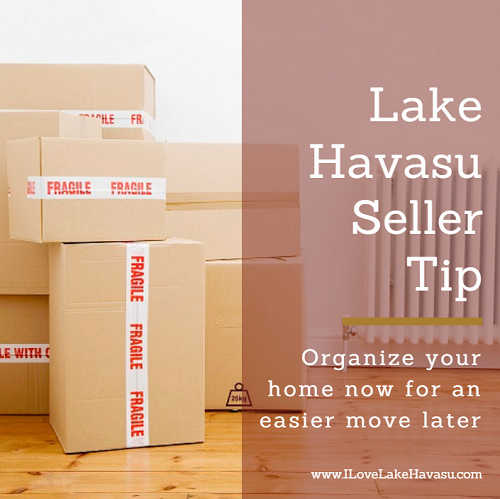 I’d like to share this helpful Lake Havasu seller tip: organize your home now so that it’s much easier to move later. Trust me, you’ll be so happy you did. My first Lake Havasu seller tip for organizing your home is to go room by room and sort everything into piles: keep, donate, and trash. If you haven’t used something in the last 12 months, consider donating it. Throw out any items considered beyond repair. This includes clothing, furniture, jewelry, linens, toys, etc. They only take up space. Everyone has that one box that seems to be moved from place to place but never opened. Take a moment and open it now. Go through it to see if you really want to keep anything. Otherwise, donate what you can and trash the rest. Next, take everything you decided to keep and pack it up in boxes. Label them clearly on the outside. Whatever you don’t use on a daily basis should be boxed up. Extra clothes, holiday decorations, the good china. It all needs to be packed up. Then, consider renting a storage unit to keep your home from being cluttered with boxes. This allows buyers to see all the space available to them. After that, get rid of any old paperwork you no longer need. Newspapers, junk mail, magazines. We accumulate a lot of paperwork when we’re in one place for any length of time. Shred old financial documents you no longer need. Lighten your load…literally. Finally, my most important Lake Havasu seller tip when it comes to organizing: be patient. Take your time. The sooner you start this process, the easier it will be for you. It isn’t unusual to spend a little time reminiscing when determining whether to get rid of an object or not. A little organization now will make your move so much easier later.